Tiny Pineapple // Be Honest With Yourself: Danger — Curves Ahead! 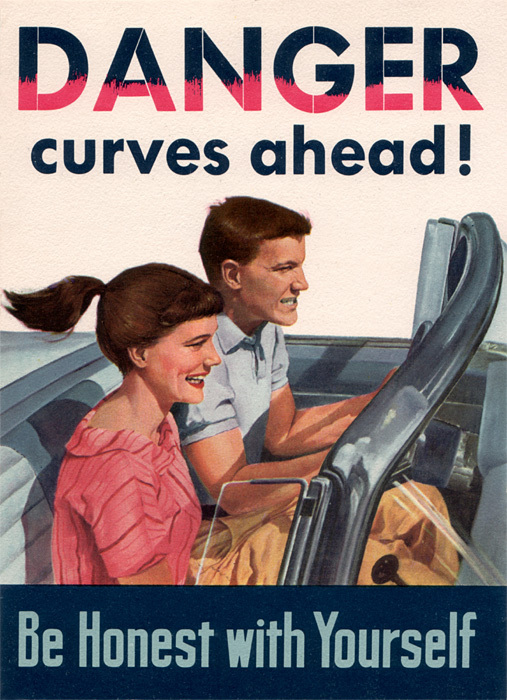 Be Honest With Yourself: Danger — Curves Ahead! A sleek, soft-purring convertible, a pretty girl, and handsome boy — or a carful of both — and an open road. What could be more thrilling, more desirable to the young and the young in heart! This is a typical picture of young America today. And there’s nothing wrong with the picture, no cause for concern. Or is there? These were not problem children: a high school senior about to graduate; a clean-cut companion, active in church, athletics. Promising futures for these youngsters — until they failed to take the curve! Then there are the other kinds of curves too often associated with young people and automobiles: the curves of temptation, on or off the highway, which too often bring tragedy and spiritual and moral death to America’s youth, curves which may throw you head-long into a spiritual or moral collision. So — slow down! Heed before you speed. It’s your highway, your car, your hazard. You hold the steering wheel. You control the throttle. It’s your life to live usefully or to spend recklessly; your life to save or lose.